The New England Patriots lost two of their first three home games this season with a defense that was historically bad from a statistical standpoint. It was enough for a panel of four NFL coaches and evaluators to rank the Patriots No. 1 -- though not unanimously -- when stacking all 12 playoff teams. Two of four insiders slotted the Patriots first. Arizona Cardinals quarterback Drew Stanton has been playing with a torn ACL, according to one of his teammates. Wide receiver Larry Fitzgerald revealed the injury in a tweet just hours after Stanton led Arizona to a 26-24 win over the Seattle Seahawks?on Sunday. Stanton missed five games from Week 11 to Week 15 after taking over for starting quarterback Carson Palmer in Week 8 because of a sprained knee. 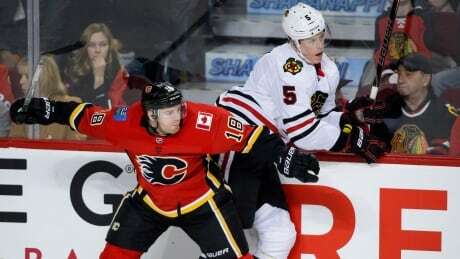 Mark Giordano scored the overtime winner on Sunday night as the Calgary Flames edged the Chicago Blackhawks 4-3. From Sept. 7 through Oct. 5 – a span of five games – Dion Lewis touched the ball 26 times. After running it just 19 times in the first five games, he led the team in carries (180 – Gillislee&apos;s 104 was next), yards (896) and rushing touchdowns (six). The United States made another late push to keep its momentum going into the medal round of the world junior hockey championship. Adam Fox scored with 1:37 left in the third period to give the U.S. a 5-4 victory over Finland on Sunday in the Americans&apos; final preliminary-round game. The defending champion Americans (3-1) finished second behind Canada in the Group B standings and will face Russia in the quarterfinals Tuesday. The Miami Dolphins&apos; disappointing season had owner Stephen Ross cursing Sunday. Despite his frustration, he said coach Adam Gase and the team&apos;s top two personnel executives will be retained. Executive vice president of football operations Mike Tannenbaum and general manager Chris Grier will also return, but Ross said he&apos;s eager to turn the page following a 6-10 season. Del Rio&apos;s departure came just three hours after the Indianapolis Colts said they also had sacked their head coach Chuck Pagano. The 57-year-old Pagano, who had been in charge of Indianapolis for six seasons, was widely expected to be sacked after the Colts posted a 4-12 record that ended with a 22-13 win over the Houston Texans. You are currently browsing the Sportspool.com Sports News blog archives for December, 2017.